Believe it or not, this is the real life "Annabelle"
- Annabelle Wallis delivers a great performance, as she's the heart and soul of this feature. 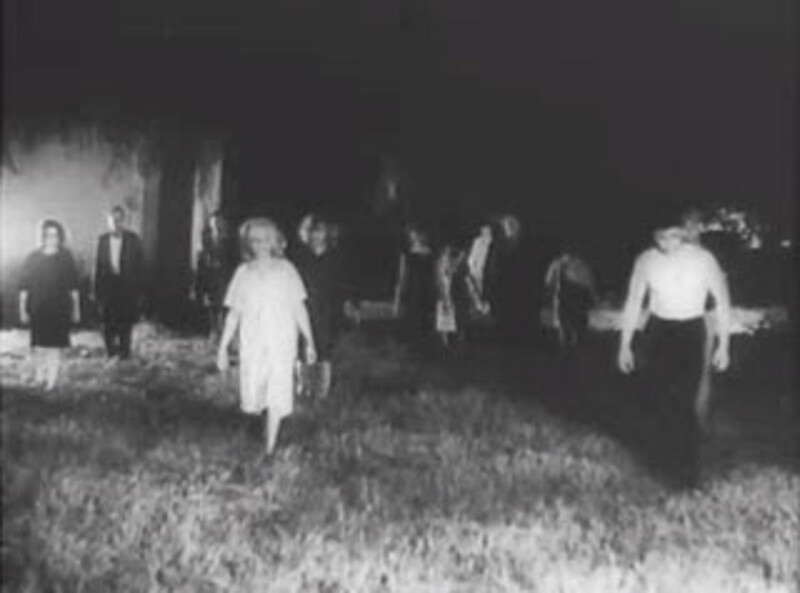 - The cinematography, the atmosphere, settings, and tone help create an eerily creepy environment. - Excellent and disturbingly shocking visuals. - Story doesn't make sense from a narrative perspective, as it contradicts certain aspects to "The Conjuring" and the real life story behind "Annabelle." - The husband was poorly written and underdeveloped. - The token black girl seems like an interesting character, but she's given little screen time to have her character developed more. - It has a plot hole around the end that makes very little sense. 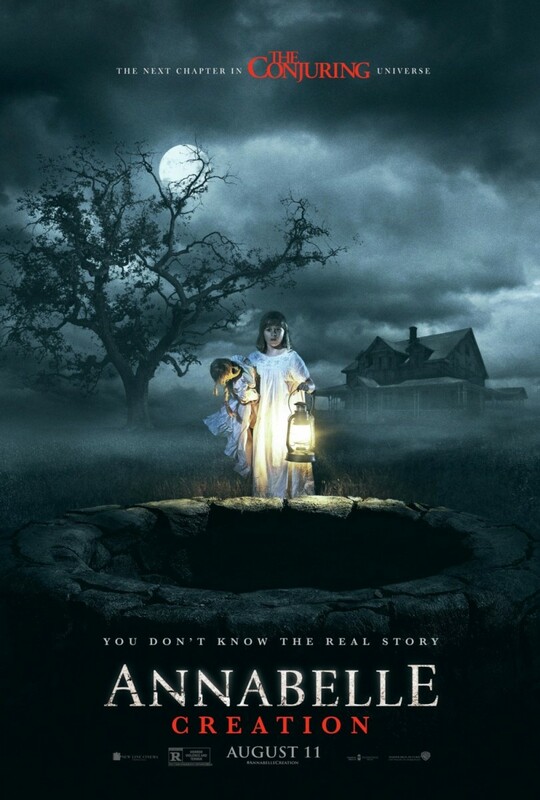 On the surface, "Annabelle" has all the elements that made the original "Conjuring" such a great horror movie. Sadly, the film falls tragically short of what it should have been. Inspired by a true story, "Annabelle" depicts the origins of the creepy doll from "The Conjuring", as it tries to explain how a satanic demon might have attached itself onto the doll to begin with. 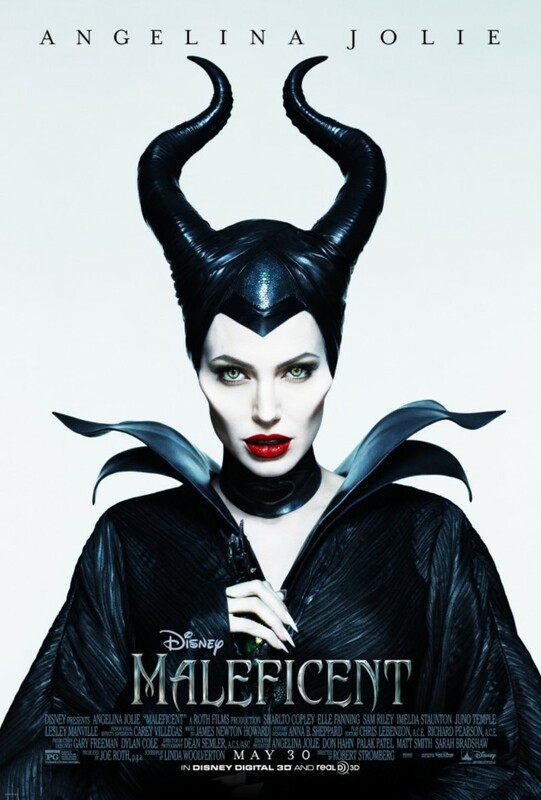 Unlike the original "Conjuring" though, the story for this particular movie is entirely fictional. None of it has ever been proven to be true, as the film tends to take a lot of liberties with the actual story behind the possessed toy. The entire story allegedly takes place before the two nurses, Donna and Angie, ever received the doll, as this prequel predates those events. To be honest, I think this might have been a missed opportunity. From what I've researched on the true story behind "Annabelle", the real story might have proven to be far scarier than what we actually got. In the original true story, it involved a young college student named Donna receiving a doll as a gift from her mother, who bought it from an old antique shop. At the time, she was living with her roommate, Angie, as they both were studying to become nurses. During that time, the doll would move around to different areas of the apartment, while they were gone. And, they would sometimes find it had changed positions without anyone touching it (i.e. the doll's arms would be crossed and etc). The nurses wondered if someone might have been playing a prank on them, by moving the doll in all these positions while they weren't home. However, there were no signs of a break in. Things got even worse when the doll would sometimes leave mysterious notes all over the apartment written in a child's handwriting, while sometimes having blood over it's hands; with hardly any ration explanation behind it. The nurses would eventually call a psychic medium, who claims the doll was merely possessed by a poor little girl named Annabelle Higgins that died at a young age. The psychic says that the little girl only wants to be loved by the two nurses, and live with them forever. The nurses being touched by this gladly accept, and invite Annabelle to stay with them forever. Little did they know that it was actually a demon using the doll to fake a possession, so it could gain permission to haunt their home. Once this was done, things started to get even worse. In fact, one of the girl's friends nearly got killed because of the doll feeling threatened by his presence. This of course would lead to them calling on the Warren couple to straighten this out, who would later reveal there was never was a deceased girl named Annabelle Higgins. In fact, they reveal it's been a demon the entire time using the doll, to trick the two girls into letting it haunt their apartment, so it can eventually possess one of them, or possibly even both. Along the way, the Warrens try to drive the doll back to their home, to keep it from harming anyone, but the doll tries to kill them by screwing with the car's engine. However, the Warrens merely splash holy water on it, while reciting an incantation before continuing on their way. Although the alleged real story sounds rather simplistic, and it was mostly explained in "The Conjuring", but the premise of the real story would have been a great one to explore. 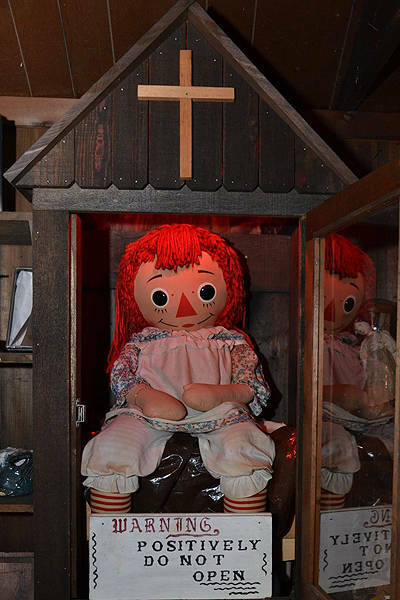 The real life story behind "Annabelle" is both disturbing, and horrifying. In fact, it's almost feels like a wasted opportunity. Instead, we're given a fictional story that not only contradicts aspects behind the real story, but it also doesn't hold up too well on it's own. The plot starts off with a newlywed couple settling into their new suburban home. The neighborhood seems quiet and peaceful at first, as it's almost reminiscent of a Norman Rockwell painting. The wife is pregnant, while her husband is an aspiring medical student. They seem like the perfect couple, as they rarely ever argue about anything. As they move into their new home, the husband buys his wife a new doll as a gift. Through a series of events, a demon attaches itself onto the doll due to the actions of their neighbors, who happen to be Satanic worshipers. Coincidentally, one of the Satanic worshipers happens to be named Annabelle Higgins. From there, the story starts to shift from what used to be a picture perfect life that eerily resembled a Norman Rockwell painting, to a work of art that may be similar to Edvard Munch's "The Scream" painting. Figuratively speaking of course. Like the original true story this film was inspired by, Annabelle starts off moving through various parts of the house while the young couple are away. Sometimes, they would find her throughout various parts of the house in different positions; even though none of them have moved her. Eventually, this leads to the doll inflicting physical harm on the wife, and her baby, which forces them to turn to a priest. However, he might be in for more than he bargained for, as this little hell spawn isn't going away quietly without a soul to take back to hell. In spite of the film's short comings, "Annabelle" is actually quite scary. In fact, there were quite a few moments, where I found myself often petrified at some of the creepy imagery. Everything from the atmosphere, the cinematography, visual effects and settings help create an eerily creepy environment chalked full of mystery and horror, as John R. Leonetti does a tremendous job directing this film. However, most of the movie's follies lie within the script itself. As I mentioned earlier, one aspect this film contradicts about the original story is that the demon couldn't inflict physical harm on anyone until someone invited it in. Heck, it's even stated in the original "Conjuring" as well. Yet in this prequel, it ignores that rule entirely. Once a demon attaches itself to the doll, it doesn't feel the need to manipulate the couple into thinking it's possessed by some dead girl, as it's already able to inflict all sorts of damage without such trivial actions. It makes it kind of confusing because, in the first film, it's clearly established that the demon had to go out of it's way to trick the nurses into letting it into their lives, so it can get close enough to possess one of them eventually. Yet in this prequel, it's basically a non factor. "Annabelle" can do whatever the hell she wants, with little to no limitations. This not only ruins the continuity of this franchise as it relates to "The Conjuring", but it makes the events of the original horror story seem kind of pointless. If Annabelle didn't need anyone inviting her in, then why couldn't she just start haunting the nurses right away? 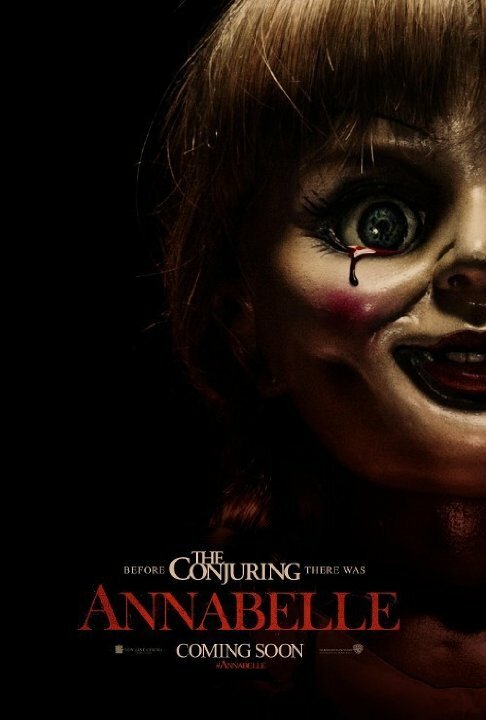 If we're to assume "Annabelle" is canon to "The Conjuring", then it only makes the whole charade of the doll tricking them seem kind of pointless. When I read the original story behind the real life Annabelle, one aspect I noticed about that story is that Annabelle was not only dangerous, but she was highly deceitful as well, when you think about it. She managed to trick two nurses into thinking she was a poor hopeless little girl that only wanted a friend, but it was all an elaborate ruse to get one of their souls. This not only made Annabelle seem diabolically sinister in nature, but highly intelligent as well to come up with such an elaborate scheme. In fact, it was even stated in the original "Conjuring" that these events happened, but "Annabelle" tosses those rules away; which makes the actions of her "Conjuring" counterpart seem kind of pointless and dumb. As for the main characters though, none of them were particularly interesting outside of the housewife that's played by Annabelle Wallis. Am I the only one that finds it weird that the lead actress of this film has the exact same name as the creepy possessed doll in this horror feature? Annabelle Wallis tries her best to carry the movie, and she practically does for the most part. Throughout the film, she resonates a gargantuan amount of vulnerability and emotion that makes you weep for her character, when we see how much the doll tortures her. However, it's the rest of the cast that falls short in this one. The husband is rarely ever in the movie because of his job, and whenever we do see him, he just comes off like some random "Gary Stu" character that you hardly ever give a damn about. You also have some African American girl that tries to help that's heavily educated in religion and the dark arts of demonology. Although the back story she's given is rather touching, and the actress playing her isn't that bad either, but she's given very little screen time for us to ever grow to care about her as a character. As for the narrative of this story, it doesn't make any sense. In the original story, there was a certain mystery behind the doll because you never quite knew where the demon came from, or even how the doll would become a conduit for it to possess others. In this prequel, everything is explained to the point that it takes out all of the mystery, which humanizes a character like Annabelle that never needed it to begin with. One of the reasons why Heath Ledger's "Joker" was such a terrifying villain in "The Dark Knight" was because you knew next to nothing about him. He was an enigma. Sure, you knew he was bats*** crazy, but you never knew what his true motivations were half the time, or even who he really was; which made the Joker come across more like a monster than anything else. In this film, it attempts to answer a question that never needed an answer to begin with. Plus, the plot hole about how the doll ends up in the antique shop is never addressed. After it's done haunting that couple, it mysteriously ends up in the antique store for some old lady to buy it for her daughter, who happens to be Donna from the original story. But how did it get in there? And why? Why not a "Toys R Us" store? Or a "Target" shopping center or something? Why specifically that antique shop? It makes no sense from a narrative perspective, and all it does is create a huge plot hole in the story. Don't get me wrong, "Annabelle" is not a bad horror flick, as it's definitely better than what most critics are giving it credit for. However, it's fairly mediocre at best. The story is lazily written, and most of the characters are poorly developed. However, it's a fairly decent horror movie to check out if you're into that sort of stuff, but I wouldn't bother going out to the theater to see it. @Movie Arbiter- yeah that's true. I think the sad thing is that this film had a lot of potential to be just as good as the conjuring...if not better if you ask me. it's just a shame we got this as a result of it. I'm afraid to watch horror movies that is why I prefer to read it's summary and your article answered my questions about this film. I feel like this type of movie always has more potential, than the end result. If they would not attempt to "Hollywood" it and stuck closer to the original source material, which is eerie enough on its own, the movie would probably be more scary and satisfying. Perfect example is the Amityville Horror story in the novel (supposedly based on the actual events), which is way scarier than what ended up in either major movie adaptation made of it.